Inner West 15000 – WW1 Enlistments of the Inner West. Close to 15000 Men and women from the Inner West Local Government including the suburbs Annandale, Ashfield, Ashbury, Balmain, Balmain, East Birchgrove, Camperdown, Croydon, Croydon Park, Dulwich Hill, Dobroyd Point, Enmore, Haberfield, Hurlstone Park, Leichhardt, Lewisham, Lilyfield, Marrickville, Newtown, Petersham, Rozelle, St Peters, Stanmore, Summer Hill, Sydenham and Tempe. This site is dedicated to listing, and capturing the stories of those men who fought in World War One and to capture stories ephemera and memorabilia from families, friends, loved ones and historical enthusiasts. It is not just the men but the women also who held full time employment and raised families as their men went to war. The AIF database lists 14462 enlistments men who went to war who either lived were born or enlisted in the Inner West. We have endeavored to include as many as we can find onto this Website. The numbers reach closer to 15000 once you add RAAF, the Navy, Nurses and Medical Staff. 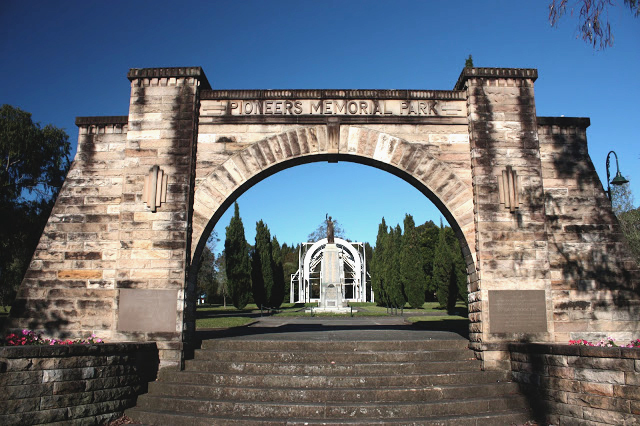 Pioneers Memorial Park was previously The Balmain Cemetery which operated from 1860 -1912 it covered 11 acres and by 1912 contained 10 608 graves. Conversion commenced in 1942 and the park was called Pioneer’s Memorial Park, dedicated to the pioneers of Leichhardt. In 1949 the War Memorial which stood at the corner of Marion and Norton Streets was re-erected in the park as a monument to the soldiers killed during both World Wars. After the closure of Balmain Cemetery burials continued at Waverley, Rookwood and Field of Mars cemeteries. This Site is dedicated to all the Men and Women remembered for their heroic participation in WW1. 15000 Men and women from the Inner West Local Government area. Inner West Council would like to find more stories of soldiers in the First World War from the community. We’re interested in photographs, diaries, letters, other personal items, and also family stories about soldiers from the First World War. This will enrich the story Inner West Council can share throughout the centenary of the First World War. 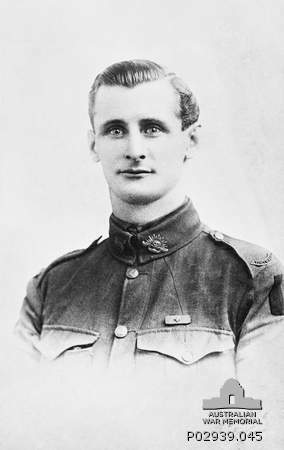 Matthew William Currey was Leichhardt’s soldier to be awarded the Victoria Cross. Image supplied by the Australian War Memorial. WAR TROPHIES. SCHEME OF DISTRIBUTION. COMMITTEE’S RECOMMENDATIONS. The committee appointed by the conference of Mayors of municipalities and presidents of shire councils, held recently to discuss the question of the distribution of war trophies, has recommended to the New South Wales State Trophy Committee a scheme of distribution, published herewith. Of the 70 trophies allotted to Sydney one has been allocated to each municipality or shire and the remaining 17 have been recommended to be distributed to the Great Public and High Schools. Owing to the repeated refusals of the Lord Mayor and City Council to receive any of the guns, no provision has been made in the scheme for the city of Sydney. All the councils and Schools concerned have been informed of the recommendations of the committee, and advised to make immediate representation to the New South Wales State Trophy Committee in Melbourne for the trophy to be forwarded. LEICHHARDT. 77 mm field gun, captured by the 20th Battalion, A.I.F., during the advance near Framervllle, in France, early on the morning of 11 August 1918. 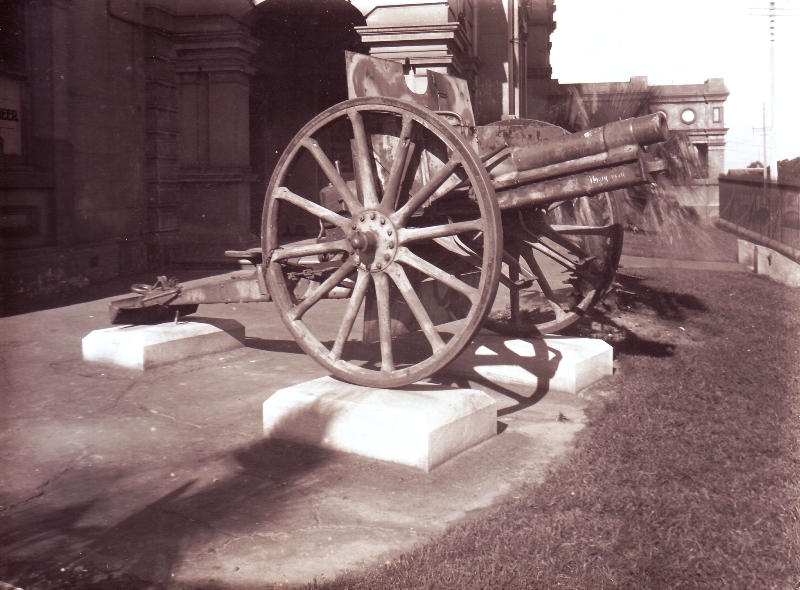 The enemy attempt to remove the gun just as the fog lifted was checked by the battalion Lewis gunners promptly knocking out four of the six horses in the team. Information in regard to this inquiry has been received from the Information Services department at the Australian War Memorial. They advise the trustees to whom the gun was granted were the Mayor and Town Clerk of the Council of the Municipality of Leichhardt. The most recent correspondence on file is the record of the despatch of the trophy to Leichhardt in 1921.